I mention the latter, as I’ve been delighted at the number of readers who’ve highlighted their specific appreciation of the valuation component of TGISVP. That would actually encourage me to focus more on the nuts & bolts of each stock valuation. Of course, the figures & formulas have always been there (in my attached TGISVP files), but putting them front & centre in every post would now make sense. In fact, that ties nicely with my overall intent – to encourage readers to research a stock’s history, management & business themselves, but to also have my valuation to hand as a straw man. Which they can choose to endorse, or choose to knock it down – but that demands they revise or replace it with their own (very specific) valuation. So, what do you think? All comments & suggestions greatly appreciated. 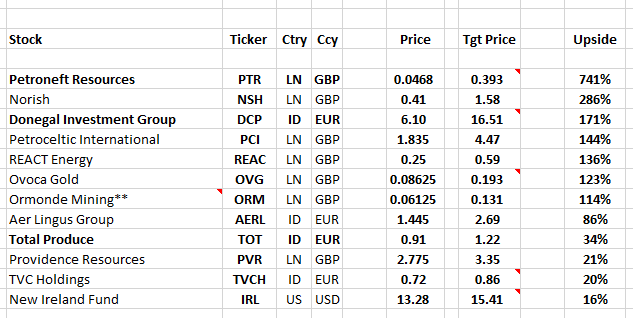 And while I’m at it – one way, or another – I’d like to hear about any Irish stocks I may have missed last year (reference the Excel file below). On my own to-do list, I’ve already got another 3 new Irish IPOs (from Q4-2013) to look over, and I recently discovered a (possibly) cheap Irish property company (relax, anxious Irish REIT investors, it’s UK-focused!). But I’m always wondering if there’s more companies out there I simply haven’t come across before. So, let me ponder the Project just a little longer… 🙂 Meanwhile, in the absence of fresh valuations, I’ll update my last TGISVP file with the latest share prices (as of Jan-17th). You may find it useful to see a snapshot, as things stand, of the Top Potential Winners & Losers. Of course, it goes without saying – but I’ll say it anyway, this little exercise obviously comes with a giant health warning! I didn’t refresh any valuations in the second half of the year – except for adding 3 new Irish IPOs (Green REIT (GRN:ID), Keywords Studios (KWS:LN) & Ardmore Shipping (ASC:US)), updating my Total Produce (TOT:ID) valuation, and adjusting for the EUR 0.495 special dividend paid out by TVC Holdings (TVCH:ID). Otherwise, remember these valuations are anywhere from 4-12 mths old. Now, much of the time, one would usually expect intrinsic values to change pretty slowly over the course of a year – after all, most news is really just noise, when you boil it down. [As I’ve said before, if you find the valuations (of your holdings) are jumping all ’round the place at the drop of a hat….it’s probably you, not them! That’s a good bad sign your judgement’s probably being swayed too easily by investor sentiment, and your own fear & greed]. But please don’t assume no change here, with any of these stocks – results and news flow can occasionally (& very suddenly) change intrinsic values quite radically. [NB: I own the three bolded stocks – PTR, DCP & TOT].